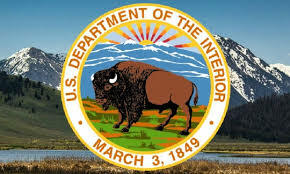 I request that you reconsider your approval of the proposed records retention schedule (DAA-0048-2015-0003), relating to the disposition of Department of the Interior records. I am very interested in the research done on the data contained in these records on America’s wild horses & burros, wildlife and resources on our public lands. I request transfer of ownership to NARA 15 years after cut-off (with the exception being 20 years after cut-off for 0016 – Resources Inventory, Study, Survey and Mapping Files), and that NARA retain all of the records listed below permanently. RECORDS DESCRIPTION: Wild Horse & Burro (WH&B) Adoption Files – WH&B Applications Which Do Not Result in Adoption – Consists of application, screening checklist, and related maps and correspondence. 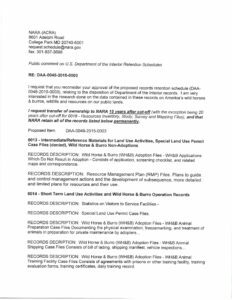 RECORDS DESCRIPTION: Resource Management Plan (RMP) Files. Plans to guide and control management actions and the development of subsequence, more detailed and limited plans for resources and their use. RECORDS DESCRIPTION: Special Land Use Permit Case Files. 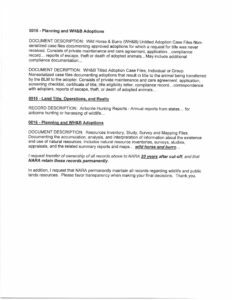 RECORDS DESCRIPTION: Wild Horse & Burro (WH&B) Adoption Files – WH&B Animal Training Facility Case Files Consists of agreements with prisons or other training facility, training evaluation forms, training certificates, daily training record. I request transfer of ownership of all records above to NARA 20 years after cut-off, and that NARA retain these records permanently. In addition, I request that NARA permanently maintain all records regarding wildlife and public lands resources. Please favor transparency when making your final decisions. Thank you. Or, you can click on these 2 pages to print and sign. That’s right, the Modoc County Farm Bureau, and specifically Laura Snell – a vocal pro-horse slaughter cattlewoman who shockingly represents the University of California as a cooperative extension agent. Ms. Snell has previously agitated on behalf of other cattlemen for the removal of wild horses from the Devil’s Garden Territory, but she has zero experience handling wild horses. Yet, she is apparently in charge at the Double Devil Corrals and was the lead in sorting and loading horses, assisted by her summer intern and several wranglers who also had no wild horse handling experience. Louie, just read this from AWHC – commented on an earlier blog. This blows my mind – the absolute idiocy of handing half a million to a farm bureau with no experience with wild horses.As if these horses havent been thru enough already – putting inexperienced people in charge? Stupidity! Thanks Louie – had seen some of the pictures – most very stocky horses – and most in good shape, BUT there are many that are not – frankly, not all of the thin ones are older horses, either. I hope they all get to be in a good place and also that these people who are taking them really are aware of what they are doing! I may not have ever been around a wild horse, but I believe it requires patience more than anything – thats why so many end up in bad places. Maggie, some of those that didn’t look to be in good shape might have been mares that had lost their foals or are still in foal. They been put through Hell. WHC also has ongoing concerns about the…. With the myriad of issues facing ALL of the horses that have been captured and made to suffer unimaginable grief at the hands of insufferable idiots whose only motivation is the big fat money, let us not forget the big picture. Forbid the BLM, the USFS, and corrupt enterprises like CATOOR to continue their assault on our Wild Ones! Interior awarded $806 million in project grants and administered $763 million in cooperative agreements during FY 2016, involving more than 18,000 grants and agreements. The person reviewing all these grant applications is Steven Howke, a kindergarten and high school classmate of Zinke who spent his career at a credit union in Whitefish, Montana, Zinke’s home town. A PEER FOIA request seeking information about how this screening process is being implemented, whether grants have been denied, or withdrawn, and what guidance has been given to applicants has gone unanswered for months. As has a similar request for information about grant screening this June submitted by a dozen Democratic senators. In other words – business as usual in this doi! Thanks for all you do for the horses! Trying to copy/paste 2-page letter to email today (before 11/26 deadline), but only one page keeps pasting into my email draft. Is there a way we could sign /submit this letter to National Archives right from your site? Maybe try to copy and paste it to a word doc first, then copy and paste from the word doc to your email? I’m not sure why it won’t completely copy and paste – but can someone else please give Fabienne some advice on this? Fabienne, you can submit your letter by using an online fax. The mismanagement needs to stop now. These horses are owned by the American people and these policies are cruel and unacceptable. There is no justification for this simply corruption and self interest! Stop this now!